Are you investing for a bull market, or a real market? 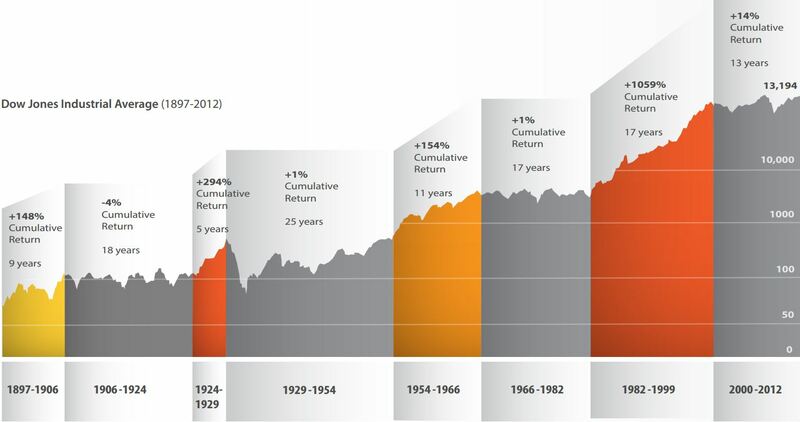 Over the last 110+ years, the stock market has shown long-term growth. However most investors have a realistic time horizon of 10-30 years to reach a major financial goal such as retirement. As the chart below indicates, the market goes through periods of growth for 10 years (on average) and periods of sideways movement lacking investment returns that last 18 years (on average). Sideways markets not only provide dismal market returns for a buy and hold strategy, they also leave investor portfolios defenseless to major market downturns as in 2008. Source: Data collected from Dow Jones/Factset. Logarithmic graph of the Dow Jones Industrial Average from January, 1897 through December, 2012. Performance displayed represents past performance, which is no guarantee of future results. The market endured a staggering draw-down of 55% in the S&P 500 from October 11, 2007 to March 9, 2009. This means that S&P 500 needed to generate a return of 122% to recoup all of its losses. These types of major market downturns can put investor goals significantly off-track, including delaying retirement plans. *This claim refers to all clients that were allocated to the Tactical All-Cap strategy from October 11, 2007 to March , 2009.